Durga is a symbol of power. On the day of Ashtami, all gods offered her with all their weapons and powers to end the demon Mahishasura. Hence this Ashtami is also known as “Virashtami”. During Navaratri, Durga is worshipped in nine different forms, each of her nine manifestations is sung by Lord Brahma – the creator of universe. On the Maha Ashtami day the tradition of Kumarika Pujan or Kanjak Pujan is practiced in almost all part of India. It is said that Swami Ramkrishna Paramhans began the tradition of Kumarika Pujan in the Bellur Math, West Bengal. His profound mind had thought of the perspective that the Goddess Durga’s energy would manifest in an ingenuous girl child. Hence during this Kanya Pujan. The girls between the age group of 6 to 9 years (pre- puberty age group) are worshipped, as it is believed they depict the 9 forms of Goddess Durga. In India, the Kumari Pujan is practiced in varied traditional ways. In West Bengal, a girl is selected for the Pooja, bathed in Ganga water and dressed like a Goddess. She is then worshiped in front of Goddess Durga idol, in the holy atmosphere where priest chanting mantras with the maddening beats of “Dhak” – a large drum- playing in the backdrop. What a grand celebration of womanhood! I was born in Maharashtrian family and raised in the middle-class locality in Mumbai where every festival is celebrated with similar joyousness and splendour to celebrate the spirit of togetherness. I can vividly recall, every year, the two ladies at my place -my granny & mother –preparing Modaks for Ganesh’s Naivedya for many neighbouring households during Ganeshotsav and my father and me always excitedly partaking in cleaning up the neighbourhood before the festivities of Diwali would sink in. The festivities of Navratri would commence with “Ghat Sthapana”- first day of the nine day long celebrations- at my friend’s home. I recall, how every year until I turned 10, I was invited for the ceremony of Kanya Pujan at her home. We friends would dress up in a nice frock and be so thrilled for the entire event. The tougher part of the ritual was that we needed to fast until the end of Puja. Her mom, who on the other days would be harsh and admonish us for ruining her routine noon catnaps due to our frolics, would surprisingly be docile and yielding of all our tantrums. All the married women from their household would wash our feet, apply Kumkum on our forehead and we were made to sit on a “Paat “– a wooden base. Then thereafter they would tie a roli (sacred thread) on our forehead or sometimes on right wrist, recite Nav Durga Aarti and touch our feet. 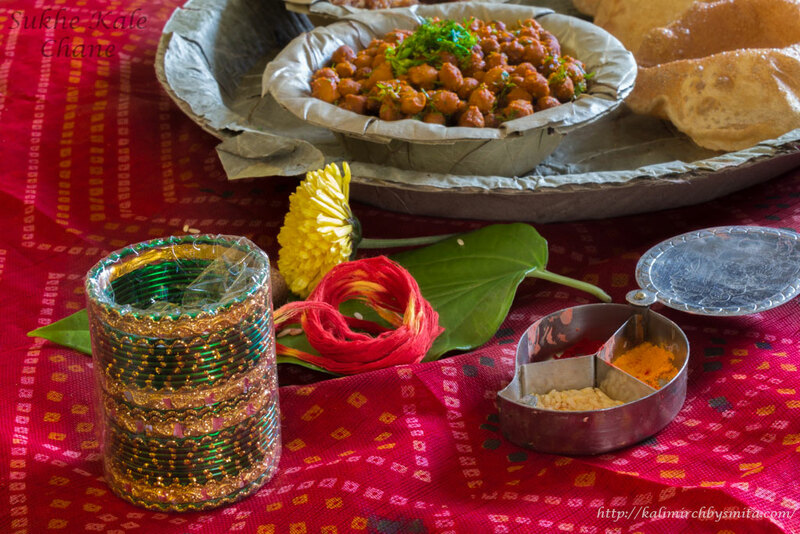 Post these rituals, would commence the joyous part of the event when we would be treated with a feast of Poori, Bhaji and desserts like Sheera or Shrikhand and finally we would depart with goodies like Pencil Cases, hair pins or sling bags with floral print! Those rituals carried faintest of significance for to me in those days, but what would thrill me beyond words was the entire idea of being treated at par with Goddess. My in-laws hail from Uttar Pradesh and I am fortunate of being witness to the diversity of these rituals and traditions in different parts of country. My mother in law is an ardent devotee of Goddess Durga. She fasts on both Navratris- Chaitra Navratri and Sharad Navratri. I have learnt from her how Kanjak or Kumari Pujan is done in Northern India (UP specifically). 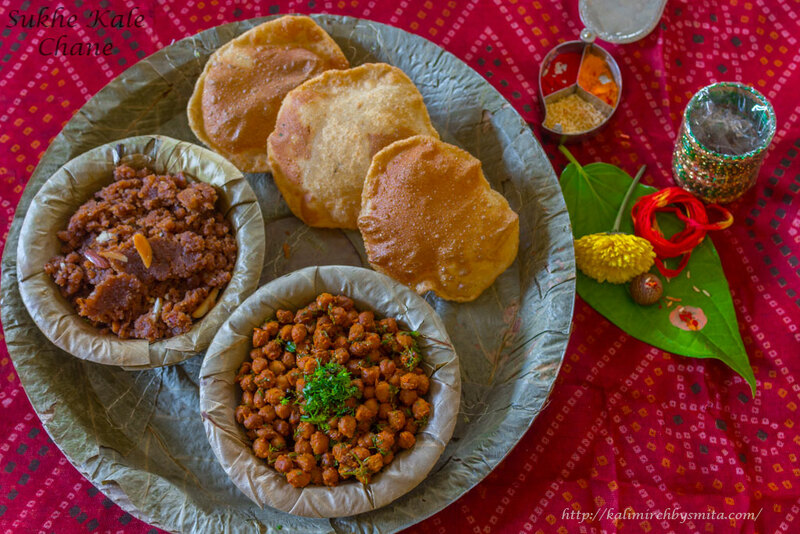 More or less the rituals are similar as the motive and rationale behind the pooja is same all over the India but a great deal of significance is imparted to the Ashtami Prasad – Sookhe Kale Chane. Poori and Sooji ka Halwa! This tradition clearly states how food and festival plays an important role in our life! Preparing Sookhe Kale Chane without onion & garlic and with basic humble spices like red chilli powder, turmeric powder, cumin seeds, coriander powder and finished with dry mango powder just tastes heavenly on this auspicious day of Maha Ashtami! 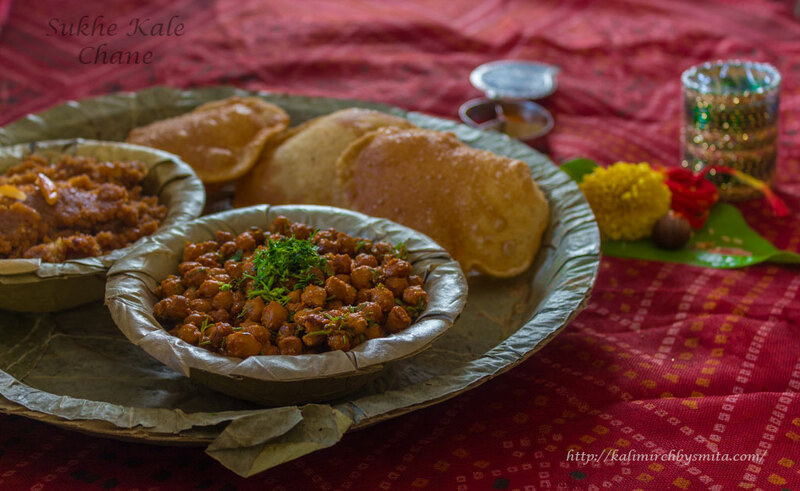 This chana recipe you can make it on any other day as a healthy option for evening snacks or tiffin recipe. In a pressure cooker put Soaked Chana. Add 1 tsp. Salt, ½ tsp. Turmeric Powder. Add enough water just above the level of Chana in the pressure cooker. Cover and pressure cook for 5 whistles on medium heat. Reserve Chana Stock. Heat 2 tbsp. Oil in a pan. Add Cumin Seeds, Turmeric Powder, Red Chili Powder, Coriander Powder and Dry Mango Powder. Add boiled Chana and mix well. Add reserved Chana Stock and mix well. Cook until the chana stock dries up. 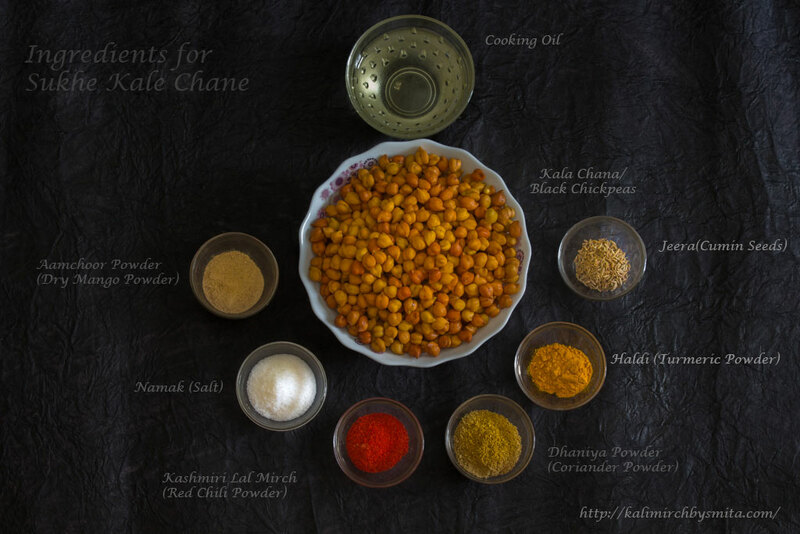 Chana Stock dries in 10 minutes on medium heat and Chana is perfectly cooked. Add salt to taste and mix well. Sukhe Kale Chane are ready to be served. Maha Prasad that is served on Ashtami-Sukhe Kale Chane.